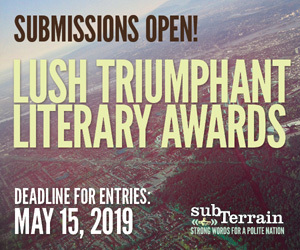 Our Annual Lush Triumphant Literary Awards competition is now OPEN. Check out the 2019 EARLY BIRD rate below! ENTRY FEE (non-refundable): Early Bird: $25 (Jan 15 - Feb 15); Regular (Feb 16 - May 15th) $30.00 PER ENTRY ($5. for each additional entry in any given category). You may send a cheque or money order along with your submission (made payable to subTerrain Magazine) or submit your entry and payment online using the Submittable link below. The winning entries in each category will receive a $1,000 cash prize and will be published in our Winter 2019 issue. First runner-up in each category will be published in our Spring issue of the following year.